I only discovered the Italian pianist Pietro De Maria when I recently purchased a 13 CD box set of the Complete Chopin Piano Works (0289 481 11671), which he recorded for Italian Decca between 2006 and 2009. What an impressive survey it is: he has a real feeling and instinct for this composer. After some research via Google, I discovered that he had just released his latest album – Book I of Bach’s Well Tempered Clavier. Pietro De Maria was born in Venice in 1967 and studied piano with Giorgio Vianello and Gino Gorini. At the age of only 13 he won First Prize at the Alfred Cortot International Piano Competition in Milan. After graduating from the Conservatory of Venice he continued his studies with Maria Tipo at the Conservatory of Geneva. Other prizes include the Critics' Prize at the Tchaikovsky Competition in Moscow (1990), the Dino Ciani - Teatro La Scala in Milan (1990), the Géza Anda in Zurich (1994), and the Mendelssohn Award in Hamburg (1997). These performances of Bach’s Well-Tempered Clavier, Book I are technically accomplished, assured and immaculately delivered. 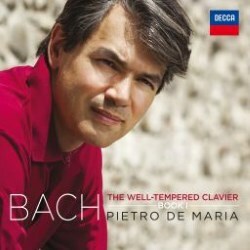 De Maria obviously loves this music and invests it with tonal beauty and a wealth of colour and shadings. Whilst the playing is rhythmically alert, there’s flexibility, and the polyphonic lines are delineated with clarity and precision. Nuance and dynamic gradients are subtly applied. Judicious pedalling never allows harmonies to be blurred in any way. There’s certainly no sense of routine or academic dryness; he brings freshness, spontaneity and intelligence to the individual Preludes and fugues, each emerging as though freshly composed. Some of the highlights are worthy of mention. The simplicity of the opening Prelude in C major has an innocence, beguiling charm and gentle flowing quality. The C minor Fugue is joyful and ebullient with a sprightly spring in its step. This infectious affability extends to the A flat major Prelude, and the G major has an animated briskness, though not quite pipping Richter to the post. One is carried along with the buoyant flow of the F major Prelude and Fugue. On the reverse of the coin, the D sharp minor Fugue conveys a sombre introspection, with the B flat minor Fugue also darkly portrayed, yet with an underlying serenity. The F minor Prelude exudes a meditative calm, allowing the listener to luxuriate in its beauty and refinement. The Decca engineers have captured the expertly voiced Steinway in superbly engineered, sumptuous sound. The sympathetically warm and spacious acoustic of the Auditorium del Suffragio, Lucca is ideally suited to highlight the polyphonic strands of the music with pristine clarity and definition. Masterly and informative annotations by Nicola Cattò shed background and context around the evolution of the Bach opus, whilst Pietro De Maria shares his own thoughts and personal insights from a performer’s perspective. Notes are in Italian with English translation. This is top-drawer playing of the finest order and I’m now eagerly looking forward to Book II.